America is known as a true touring machine. The Band has played at least 100 shows per year for the past 41 years. I don’t believe there are too many that can stake that claim. Monday night at the Buffalo.com Grandstand at the Erie County Fair, America displayed why they are so endeared by many fans. Starting off the show with their usual opener “Tin Man”, the band delved deep into their catalog. They play four songs each from their first two albums and also mixed in some songs from the brand new Back Pages release. Back Pages just released in July, is America’s take on some classics along with some surprises. One of those is a cover of The Gin Blossoms’ “Til I Hear It From You”, which was featured and did not sound out of place in the least. As the band introduced many of the people who help make the show happen, it was more apparent how important their sound guy is. The sound was one of the best I’ve heard. 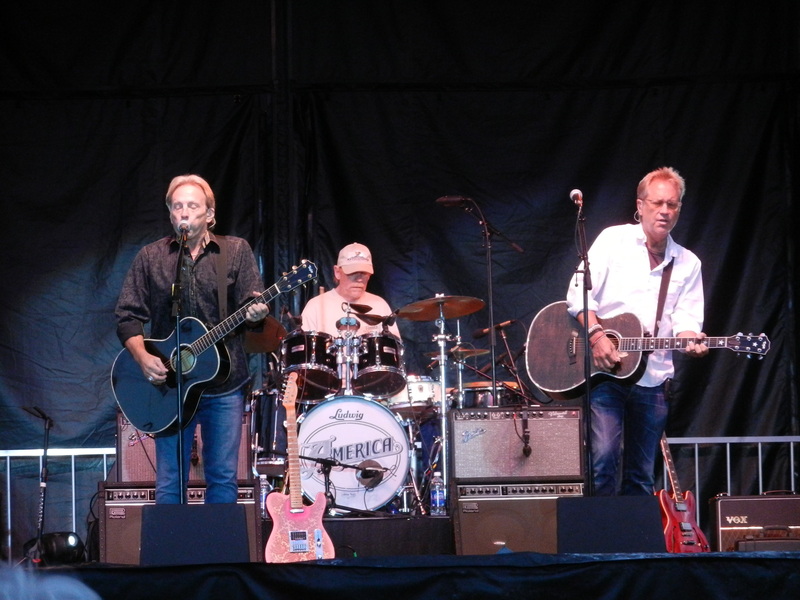 Gerry Beckley alternated between the guitar and keyboard throughout portions of the show and really shone on the classic “Daisy Jane”. Guitarist Dewey Bunnell was no slouch and neither was the rest of the band. Drummer Willie Leacox has now been with the band for 37 years. Rounding out the quintet were bassist Richard Campbell and guitarist/keyboardsist Michael Woods. In closing, it takes a lot of good talented people to put on a great show. The band has surrounded themselves with some fantastic people and the evidence is in their live show. “A Horse with No Name” closed out the show and the ovation the band received was well deserved. On the up side- Good to see 3 songs from the new album in the set. Daisy Jane and Woman Tonight were amazing. On The Down Side- would have liked the band mention more on other founding member Dan Peek who passed away a few weeks ago.